Eligibility: NO PURCHASE NECESSARY. A purchase will not increase your chances of winning. Void where prohibited or restricted by law. 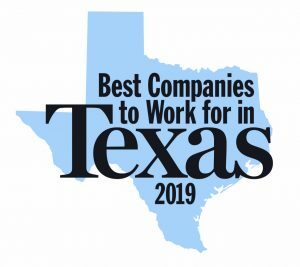 Must be a legal U.S. resident ,residing in A#1 Air service area (defined as the Dallas,-Ft. Worth, TX Metroplex) and 18 years or older to enter. Entrant is not eligible if he/she is an employee of Sponsor or a member of the immediate family (defined as parents, children, siblings or spouse, regardless of where they reside) or household of any of the above persons. By entering, Entrant agrees to abide by these rules and all decisions of Sponsor, which are final in all matters relating to this Promotion. Entry Period: The Promotion begins at or about 12:00 PM Central Standard Time (“CST”) on October 8, 2018 and ends at 11:59:59 PM CST on December 7, 2018 (“Entry Period”). The Sponsor’s computer is the Promotion’s official clock. Grand Prize: There will be one (1) grand prize package. The “Grand Prize” consisting of 2018 Ford F150 Raptor. Approximate retail value (“ARV”) of $69,810.00 Sponsor reserve the right to substitute any portion of the Grand Prize for one of equal or greater value. Winners may not request Grand Prize substitution. Grand Prize is non-transferable and may not be claimed or used by any person other than the winner. By accepting the Grand Prize , the winner agrees that Sponsor and its designees may use his/her name, voice, photograph, likeness, address (city and state), biographical information, Grand Prize information and/or statements about this Promotion for advertising and publicity purposes in all media worldwide at the discretion of the Sponsor without limitation, further compensation or notice. Any portion of Grand Prize not accepted by winner will be forfeited. Federal, state, and local taxes on Grand Prize and any expenses relating to the acceptance of and use of Grand Prize not specified herein are the responsibility of winner. ARV is as of the time the rules were printed and the value of a Grand Prize may fluctuate. A winner is not entitled to any difference between the ARV and the actual value of the Grand Prize at the time the Grand Prize is awarded. 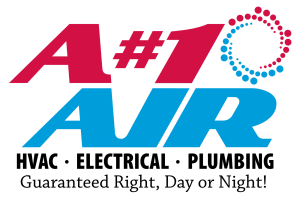 To Enter: To be eligible, entrant (“Entrant”) must provide the sponsor of this A#1 AIR’S THE ULTIMATE TAILGATE GIVEAWAY (the “Promotion”), A#1 AIR ( “Sponsor”) ,with its full name, email address, phone number, address, zip code and date of birth. Limit one (1) entry per person per day for the contest period. Sponsor will not be responsible for entries lost, delayed, incomplete or misdirected. Entries will become the sole property of Sponsor and by entering, Entrant expressly consents to adding his/her name to receive future promotional offers, and using Entrant’s name for advertising, publicity or any other purposes whatsoever, as determined by Sponsor in its sole discretion, without compensation and with or without attribution to Entrant, as Sponsor elects. Only one Finalist or Grand Prize winner per household is permitted during the Contest Period. Any person found using multiple Facebook and/or email accounts to enter the Contest will be disqualified. Online Entry: Entrant may go to www.Anumber1Air.com and follow the directions for registering. One entry per person per day is allowed throughout the contest period. Mail-In Entry: Entrant may hand-write his/her complete name (no initials), valid e-mail address, street address (P.O. Boxes not accepted), city, state, ZIP code, telephone number, a Keyword, and date of birth (MM/DD/YYYY) on a 3½”x5” card (“Mail-In Entry”) and mail in an envelope with proper postage affixed to: A#1 Ultimate Tailgate Entry Attention: Marketing-Client Services, A#1 AIR E 601 Corporate Drive, Lewisville, TX 75057. Each entry, regardless of the submission method, will have an equal chance of winning. To obtain bonus entries, potential entrants must “like” A#1 Air on Facebook via the Official A#1 Air Facebook page at www.facebook.com/anumber1air. To participate in the earning BONUS entries, (1) post an original “selfie” with you and your North Texas Food Bank donation of canned goods with (a) one of our A#1 Air team members or (b) donated at designated Partner Drop Off sites. (2) Share via your Facebook, Twitter or Instagram account during the Contest Period and (a) tag @anumber1air and (b) include the hashtag #FillTheTailgate. Entries must also be posted to the Official A#1 Air Contest page through the contest entry form and include #FillTheTailgate in the caption. 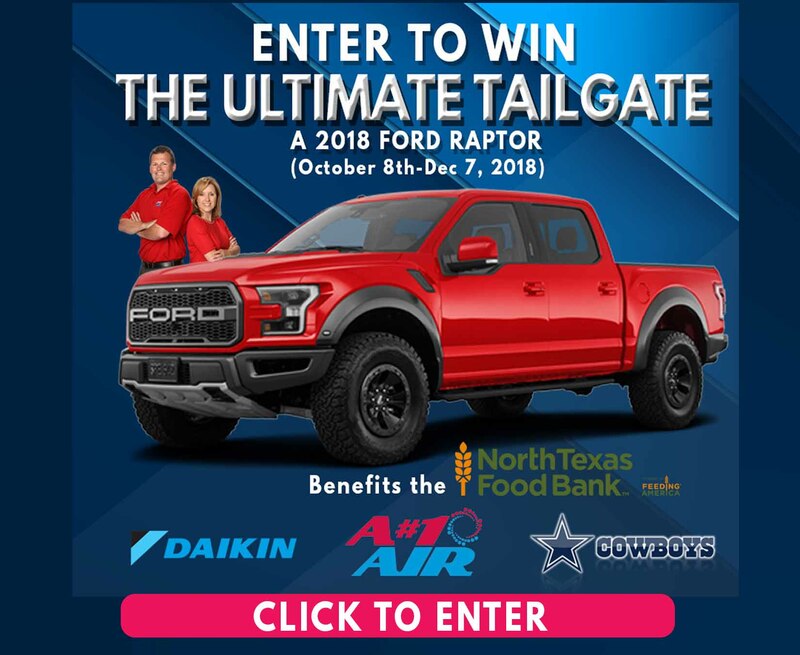 Instagram and Twitter hashtag entries via #FillTheTailgate must also be uploaded through the A#1 Air Ultimate Tailgate Giveaway BONUS contest entry form to be eligible. Limit one (1) entry per person/email address/per contest period. If an entrant submits multiple entries per contest period, all subsequent entries (other than the initial entry) will be automatically disqualified. All entries are subject to verification by the Administrator. Entries must be uploaded in compliance with the Contest requirements. Entry entries that do not meet the specifications or otherwise do not comply with the Official Rules herein may be automatically disqualified. Incomplete, illegible or mutilated entries will be automatically disqualified. No responsibility is assumed for lost, late, misdirected, damaged, altered or illegible entries. Any attempted form of entry other than as described herein is void. Administrator and or Sponsor will determine in its sole discretion what constitutes a valid entry. All materials submitted become the property of the Sponsor and will not be returned or acknowledged. In the event of a dispute about the identity of an entrant, entries will be declared made by the Authorized Account Holder of the e-mail address submitted at the time of entry (if eligible). “Authorized Account Holder” is defined as the natural person who is assigned to an e-mail address by an Internet access provider, online service provider or other organization (e.g., business, educational institution, etc.) that is responsible for assigning e-mail addresses for the domain associated with the submitted e-mail address. The potential winner may be required to provide Sponsor with proof that the potential winner is the Authorized Account Holder of the e-mail address associated with the winning entry. Entries must be submitted from a valid e-mail account, which may be identified by reverse domain name search. Must be your own original work. Cannot have been submitted in any other prize promotion or featured on a public website. May only contain content, for which you have, or have the power to grant, all required consents and approvals. Cannot contain, as determined by Sponsor, content that is sexually explicit, violent, derogatory of any ethnic, racial, gender, religious, professional or age group, which violates any law, or which communicates a messages inconsistent with the positive good will to which we wish to associate. Use of any elements that are not original or in the public domain will result in disqualification of a submission, in the Sponsor’s sole discretion. If a submission depicts any third party, that third party must be of the age of majority in his/her jurisdiction of residence and you must have permission from that third party to grant the rights to the Sponsor described in the “Sponsor’s Rights to Entries” section below. By submitting an entry, you represent that (a) you are the creator of the submission, (b) you own all rights to the submission, (c) the submission does not infringe upon or violate the intellectual property, privacy, or other rights of any third party, (d) the submission has not previously been entered in any other contest, and (e) the submission has not been previously published in any medium. DRAWING/NOTIFICATION OF FINALISTS (5): At the conclusion of the Promotion, Sponsor will select the name of 5 finalist[s] in a random drawing of all eligible entries received during the Entry Period. The odds of being selected as a potential “finalist” depend on the number of eligible entries received during the Entry Period. A Potential finalist will be notified by telephone or email after the drawing with instructions on how to claim the Grand Prize. Each finalist will be required to sign and return an Affidavit of Eligibility and Liability/Publicity Release (except where prohibited) and any other requested documents within the time period specified in the notification email or the Finalist designation may be forfeited in its entirety and awarded to an alternate winner, at the Sponsor’s sole and absolute discretion. At the conclusion of the Promotion, Sponsor will select the name of Grand Prize Winner in a random key draw of all finalist (5) at Prize Reveal Ceremony. The finalist who draws the key that starts the Grand Prize will be named the Grand Prize Winner. The odds of being selected as a potential Grand Prize winner depend on the number of eligible entries received during the Entry Period. A Potential Grand Prize winner will be notified by telephone or email after the drawing with instructions on how to attend the Grand Prize Reveal Ceremony where the random key draw will take place. The Grand Prize Winner will be required to sign and return an Affidavit of Eligibility and Liability/Publicity Release (except where prohibited) and any other requested documents within the time period specified in the notification email or the Grand Prize may be forfeited in its entirety and awarded to an alternate winner, at the Sponsor’s sole and absolute discretion. Failure to provide all required information and a signature on the documents within the stated time period may result in forfeiture of winner’s right to claim the Grand Prize, and may result in the Grand Prize being awarded to an alternate winner, if time permits. Sponsor reserves the right to conduct a background check on any potential Grand Prize winner and reserves the right in its sole discretion to disqualify any person based on such background check if Sponsor determines in its sole discretion that awarding the prize to such potential Grand Prize Winner might reflect negatively on Sponsor or any of the Released Parties. Disclaimer: Each Entrant in this Promotion agrees to release and hold harmless the Sponsor, A#1 Air. Any associated partners and/or their affiliates including Daikin, North Texas Food Bank, North Texas Ford Dealers and Dallas Cowboys. and each of their respective parent companies, divisions, related entities, affiliates and subsidiaries, and each of their directors, officers, employees, agents, representatives, successors and assigns, and all others associated with the development and execution of this Promotion, including without limitation, any prize providers (the “Released Parties”), from and against all claims, including but not limited to mechanical errors and other errors, inaccurate, fraudulent, incomplete, late, lost, misdirected entries; or any delays in delivery of prize; or bodily injuries, death, losses or damages of any kind, without limitation, that may arise from or in connection with Entrant’s participation in this Promotion or acceptance, possession or use of the prize(s), or participation in prize-related activities. By participating in this Promotion, Entrant agrees and acknowledges to be bound by these official rules, all Sponsor-related terms and conditions, as well as the decisions of Sponsor which are final and binding in all respects; to waive any rights to claim ambiguity with the official rules. Applicable Law: This Promotion and these official rules shall be construed and governed in accordance with the laws of the State of Texas. As a condition to participating in this Promotion, each Entrant agrees that any and all disputes that cannot be resolved between the parties, and all causes of action arising out of or in connection with this Promotion will be resolved individually, without resort to any form of class action, exclusively before a court located in the State of Texas. The Entrant and Sponsor hereby waive any and all right to trial by jury. If any provision of these official rules are declared or found by a court of competent jurisdiction to be illegal, unenforceable or void, then such provision will be null and void but each other provision hereof not so affected will be enforced to the full extent permitted by applicable law. All federal, state and local laws and regulations apply. General: This promotion is in no way sponsored, endorsed or administered by, or associated with, Facebook, Twitter, Instagram or Google. If, for any reason the Promotion is not capable of running as planned, including infection by computer virus, bugs, tampering, unauthorized intervention, fraud, technical failures, or any other causes beyond the control of Sponsor, which corrupt or affect the administration, security, fairness, integrity or proper conduct of the Promotion, Sponsor reserves the right at its sole discretion to cancel, suspend or modify this Promotion, in whole or in part without notice. Promotion is subject to all applicable laws. Income and other taxes or tariffs, if any, are the sole responsibility of the winner. Other restrictions may apply. All rights reserved.  Winners List: For a list of winners, available after Dec 20, 2018, send a self-addressed envelope to: A#1 AIR E 601 Corporate Drive, Lewisville, TX 75057. Requests must be received by Jan 30, 2019.